An illustrated example of how moon transits cast shadows on Jupiter. An unusual celestial vanishing act will take place the night of Sept. 2 when all four of Jupiter's largest moons will be hidden from our view. The event will occur on a night when Jupiter happens to be positioned very close to Earth's moon in the southeastern sky. The two objects, though very far apart in space, will be about 5 degrees from each other in our sky (your fist on an outstretched arm covers about 10 degrees of sky). This pairing makes Jupiter, which outshines all stars and so is easy to spot, even easier for anyone to locate. Anyone who points a small telescope at Jupiter will nearly always see some or all of the four well-known Galilean satellites. Usually at least two or three of these moons, and sometimes all four, are immediately evident as small star-like points of light. 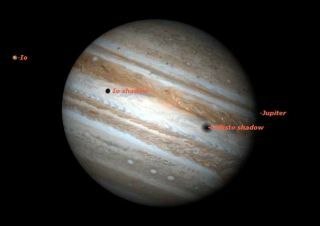 3) they are within Jupiter's shadow (in eclipse). The first-ever recorded observation of Jupiter "without a visible satellite" was apparently made in 1681. Writing about this lone episode in his 1844 book, "A Cycle of Celestial Objects," William Henry Smyth commented that this was "a conjunction which will require more than three thousand billions of years to occur again." Smyth's estimate was a gross exaggeration. While such "moonless" occasions are rare, there are actually a dozen or more per century. Gian Vincenzo "Enzo" Mora of Sequals, Italy made the first extensive calculation of Jupiter's moonless occurrences in 1909. His listing, obviously intended to be exhaustive, spanned the entire 19th and 20th centuries. The studies of Mora were meticulous and no doubt required a tremendous amount of time, and all without the aid of modern computers. Modern studies, using computer technology, have demonstrated that Mora's computations were amazingly accurate, although he did overlook three occasions (in 1859, 1895 and 1962) when Jupiter appeared without satellites. A new set of predictions has recently been drawn up by the Belgian calculator Jean Meeus for the period from 1900 to 2100 AD. According to his calculations, on the night of September 2-3, viewers across North America will have the opportunity to see all four moons out of sight for almost two hours. Jupiter is very bright right now and easy to spot with the naked eye, at magnitude –2.0 (on this scale smaller numbers represent brighter objects, and negative numbers are the brightest). The gas giant planet will be in the eastern sky, in Capricornus, well up for most locations when the "moonless interval" begins at 12:43 a.m. EDT on Sept. 3 (for the Central, Mountain and Pacific Time Zones, it's the previous calendar day, for example: 9:43 p.m. PDT on Sept. 2). Io will be occulted by Jupiter's disk and then will move into Jupiter's shadow to undergo an eclipse, with no sunlight falling on it to reflect to our telescopes. Europa and Ganymede will both be in transit across Jupiter's disk, and so they'll be impossible to see in small telescopes amid the overwhelming sunlight reflected by Jupiter. Seasoned observers with large telescopes might spot the moon's shadows that fall on the Jovian cloud tops. Callisto will be in eclipse. Ganymede will be the last to disappear at 12:43 a.m. ET. Then, at 2:29 a.m. EDT, Io will reappear into view as it emerges from Jupiter's shadow.